Arulraj is one among thousands of people in the North who find it difficult to access safe drinking water as nearly a million people are affected due to the worst drought in the country. They allege that authorities are slow to address their issues, which is affecting their livelihood. Farmers complain that their paddy-fields are completely destroyed and they are compelled to look for other options, such as petty jobs, to make a living for their families. There are no solutions in sight for these residents in the islets, and middle-class families are considering moving out. Mr. Arulraj says that although every Grama Sevaka division was provided with rainwater harvesting tanks under the initiative of the Office for National Unity and Reconciliation, this remains a temporary relief. The Disaster Management Unit says 1.05 million people in 13 districts are badly affected by the drought. 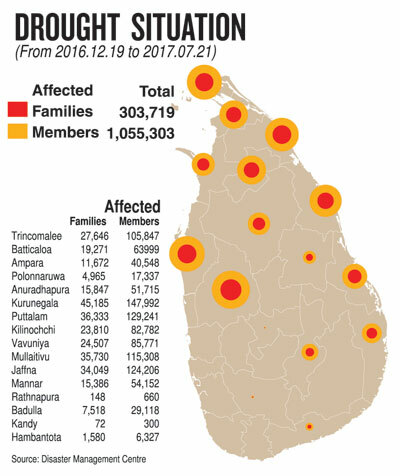 Among the worst affected districts are Trincomalee, Mullaitivu, Jaffna, Anuradhapura, Kurunegala, Vavuniya, and Mannar. The Unit’s deputy director, Pradeep Kodippili, told the Sunday Times that district level disaster management units are involved in relief work. 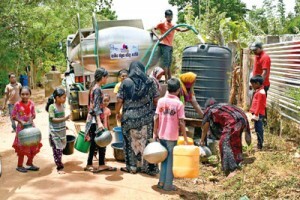 Mullaitivu residents said the drought has worsened the prevailing poverty. Farmers complain that the Yala season cultivation has been destroyed because tanks and rivers have run dry. The Mullaitivu District Secretariat said at least 115,308 people from 35,730 families have been badly affected. Drinking water and dry rations are provided to residents. “Out of 136 Grama Sevaka divisions in the district, some 60 divisions are currently being provided with drinking water through tankers. We have asked for more aid, but we are yet to hear from the Government,” District Secretary Ms. Rupavathi Ketheeswaran said. Meanwhile, farmers in Kilinochchi complain that some 860 acres of paddy land are endangered as the Iranamadu reservoir, the main source of water for Yala cultivation, is drying up. Muththu Sivamohan, Secretary, Iranamadu Farmers Union said 350 acres of paddy land in Kudamuruddy is destroyed. “We are left without any paddy for the next season, even for our use,” he said. He complained that the Government is slow to act in helping farmers. Farmers were assured of drought relief in three stages. During the Sinhala-Tamil New Year, Rs.8,750 was deposited to their accounts as a first instalment. But since then, three months have passed, and the next cash instalment is yet to be made. An official at Kilinochchi Agricultural Department said there is no word yet from the Government on drought relief payments.